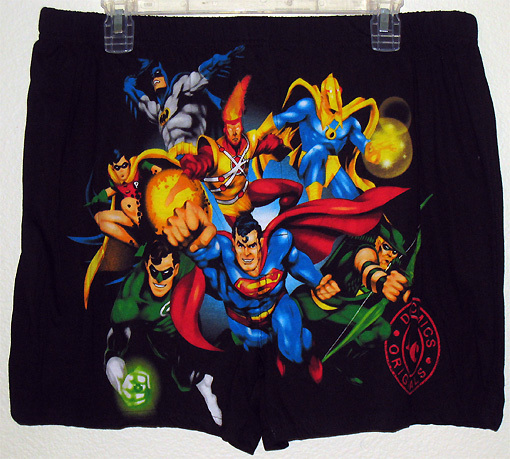 I never thought I’d live to see the day they put Firestorm on a pair of boxers! Check these out! I can understand putting Superman, Batman, Green Lantern, Robin, and even Green Arrow on licensed merchandise. They are all characters the general public is likely to recognize. But Firestorm and Doctor Fate?!?! They happen to be two of my favorite characters, but I’m not sure anyone in the general public would be able to identify them. They both have proven time and again they can’t support their own monthly comic books. Oh well, I’m not complaining! My thanks to Patrick, long time Firestorm fan. He e-mailed me last week after seeing these boxers in K-Mart. I ran out to the store and picked up a pair myself. You should still be able to find a pair at your local K-Mart (possibly other retailers as well). I’m really pleased that Firestorm was placed in the center of the image. After Superman, Green Lantern, and Green Arrow, the focus is really on Firestorm (even more so than on Batman). The only downside is that Firestorm is right on the flap of the boxers. Awkward. Just be thankful I didn’t model them for you! Posted in: Apparel, Firestorm #01: Original (Ronnie/Martin). Wow! No Hawkman, but That Goateed Moron, Firestorm, and Dr. Fate make the cut?! What the–! “Goateed Moron”. Wow. I bet you’re counting on Adama reading this.